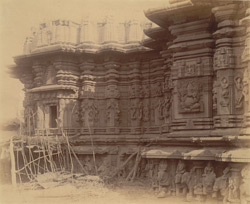 Photograph of the exterior wall of the Kopeshvara Temple, Khedrapur taken by Henry Cousens in the 1880s or 1890s. Khedrapur is located in the Kolhapur district of the modern state of Maharashtra. Cousens gave an excellent description of the temple in 1897 : ''...on the Krishna, 30 miles east of Kolhapur...a comparatively late structure of the style of the great temple in Kolhapur city...It has never been finished, save with rude brick and plaster in the most vulgar style. The workmanship, though elaborate and careful, lacks the finish, delicacy, and richness of design which are found in the older work." This photograph gives us a clear view of the mouldings and sculptural details of the temple.